The students in the Toddler 1 classroom love to care for their environment. The new mirror washing work quickly became quite popular and seems to be in constant use throughout the morning. 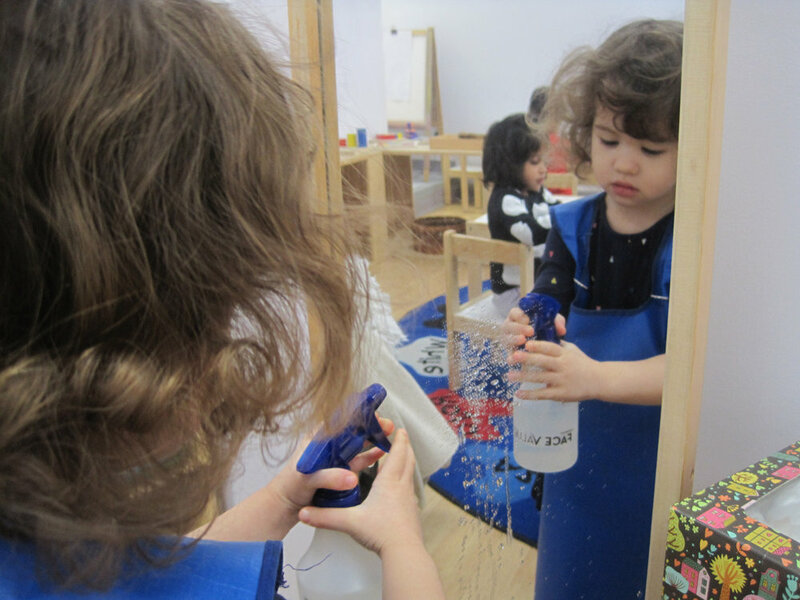 After putting on a smock, the students use a child-sized spray bottle to put two (…or sometimes ten) squirts of water on the mirror. Then they use a sponge to carefully yet vigorously wash the mirror from top to bottom. Finally, they wipe up with a washcloth, making sure to catch any stray drips. This work feels quite purposeful to the Toddlers, resulting in great time and care being dedicated to this activity. Mirror washing also provides a positive outlet for physical energy, incorporating plenty of gross motor movement. One student even thought to bring over the step stool so he could wash and dry every last inch!